Seattle isn’t known as a beachfront city, but we’re home to over 200 miles of shoreline along Lake Union, Puget Sound, and Lake Washington. We enjoy popular spots like Alki, Madison Park, and Golden Gardens for a dip in the water or a cozy bonfire. But few know about the 149 secret beaches that dot our shores. The Seattle Department of Transportation’s (SDOT) shoreline street end program designates any unoccupied land between a street end and the shoreline as public right of way to be “preserved and improved for public use”—in essence, a micro beach. SDOT admits that as many as two-thirds of the sites are “unmarked, overgrown, or have private encroachments.” Work is underway to improve these hidden spots into public gems. The department set aside $400,000 in 2014 to improve nine such sites across the city, working with local residents and community groups. 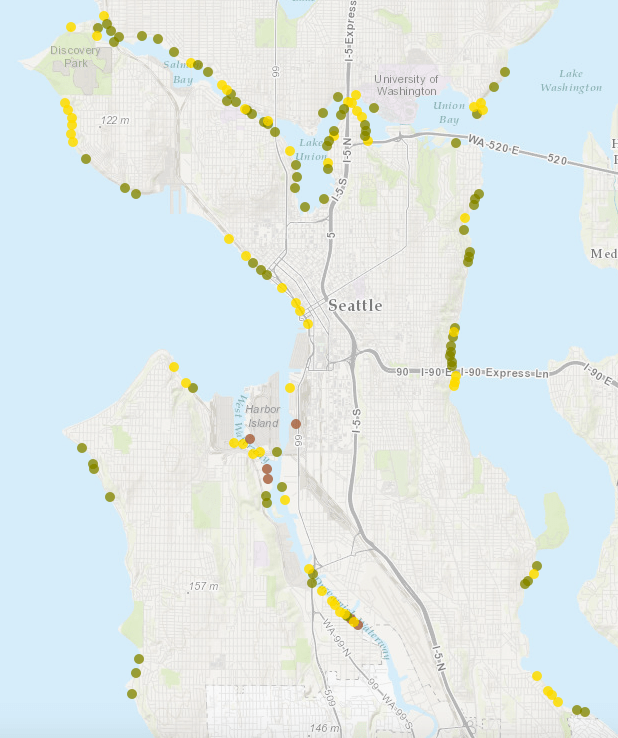 You can check out a map of all 149 beaches, each of which is marked as “worth a visit,” “not yet ready for visitors,” or “no public access.” Concentrations are densest in South Park, Leschi/Mt Baker, Portage Bay, North Queen Anne, Eastlake, Magnolia, and Ballard. Every street end park should have a bench facing the water, both a symbolic and real amenity. The Slog just published a piece about some of these beaches.